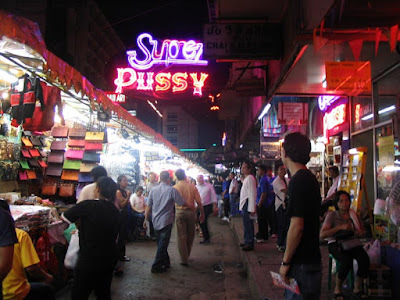 After a day at the palace and on the river taxi's yesterday we thought that we would go for a few drinks in Pat pong. Interesting place for sure. An eclectic mix of lady boys, Brits abroad and 60 year old men with 20 year old Thai brides. 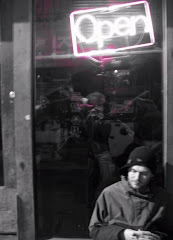 After a few beers in some visually stunning local bars we decided to move on for some late night drinks elsewhere. 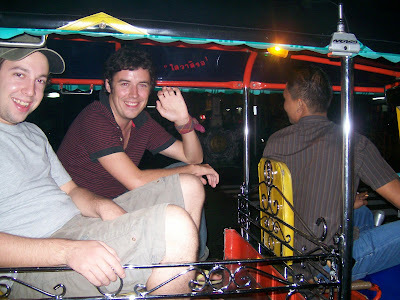 After the usual wrangling over the price we got ourselves two Tuk-Tuks back to Ko San Road. 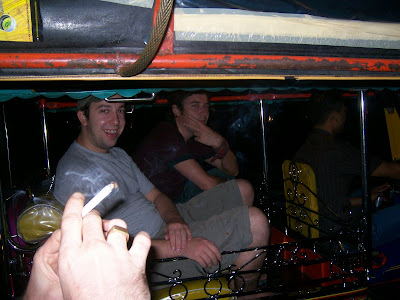 An impromptu race ensued between our two Tuk-Tuks with both teams jeering on our respective drivers. Having been way out ahead in our clearly superior vehicle, our guy decided that we had enough of an advantage to actually stop at some traffic light. 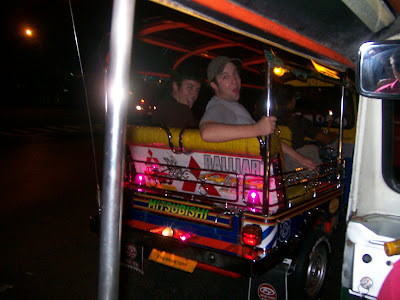 Jay and Mike's Tuk-Tuk came up on the inside and also stopped for the lights. It was gonna be close so both drivers were revving their engines. As the diesel fumes chocked us we eagerly awaited the green light. Adding to the race track feel was the fact that Thai traffic lights have a count-down timer. 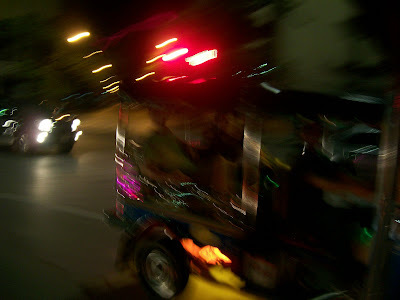 As the lights changed and our guy let out his clutch, I looked across at the opposition just in time to see their Tuk-Tuk do a wheelie. A proper wheelie, at 45 degrees, with Mike and Jay in the back, they soured off of the line like a dragster. Luckily what our guy lacked in style, he made up for with sheer driving skill and the mentality of an immortal. We arrived three minutes later, first and all in one piece. Certainly the best 25p I've ever spent on a cab!